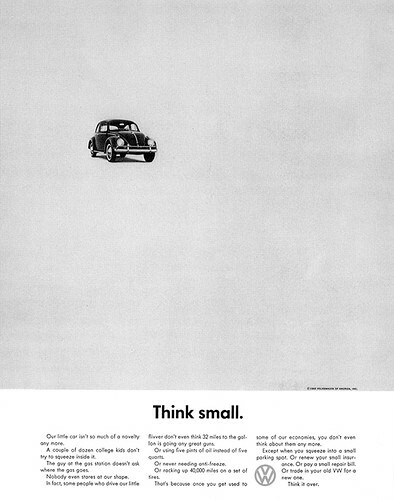 Arguably the most important thing to ever happen to advertising, the Volkswagen “Think Small” ad debuted in 1959. It brought a not-too-pretty, small, cheap car into the spotlight among the American auto industry. In a world where bigger is typically perceived as better, Volkswagen chose to use a different perspective when showcasing their Beetle model. Ironically enough, this approach captures your attention, doesn’t it? Why? Because you don’t expect the assertive and confident statement before your eyes. This is an advertisement that hardly feels like it is trying hard to “sell” you. You read the ad just to figure out why in the world thinking small could possibly be a good thing. With brutally honest statements that make consumers believe VW is a brand they can trust, Volkswagen takes advertising to a whole new level with this campaign.